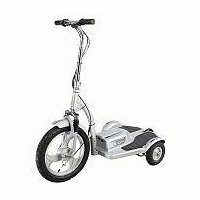 Unique 3 wheel electric scooter. 36V sealed lead acid battery and UL listed charger. 12" pneumatic front wheel, puncture proof rear tires. Large stable platform to stand on. Easy to operate hand throttle at riders finger tips.